A Soft Wall, such as a textile curtain, preceded a Soft Room as an open plan room divider, but open plans, such as a loft, encouraged a Soft Room solution to space. Designr Petra Blaisse states that the softening of edges is an inviting creation of shelter. Likewise Rem Koolhaas explains that he can make his buildings more harsh and pure because this counterpart exists.2 The curves and bends of Soft Room not only soften the rigid perimeter of right angled spaces but add movement to it. According to researcher Mijin Juliet Yang, the slightest breeze can create an undulating edge with the curtains’ pleats and folds maximizing and minimizing spatial flow.3 Otherwise, functionally, Soft Room provides privacy through visual, aural, and physical isolation. In physical terms, it can reduce the scale of a large space creating an intimate confine within it, as well as section off a room4 of a small space without compromising it as thick walls would do. Furthermore, it is economic and easy to install, permits flexibility in the design by making rooms appear and disappear with seamless effort, and offers thermal control and shading solutions through the filtering or blocking of light. A Soft Room, typically made of fabric, evolved with the discovery, manufacture, and development of new fibers. Initially, natural fibers, such as animal fibers (wool, camel’s hair, and silk) and vegetable fibers (cotton, linen, jute, and kelp) were the only ones used. In the 20th century synthetic fibers (rayon, nylon, dacron, dynel, saran, vicara, and fiberglass) contributed to the new textile properties of non-inflammability.5 More recently, unorthodox yarns (lucite, cellophane, bamboo, grass, metallic threads, strings of beads) have been added to the preexisting fibers,6 adding texture to Soft Room and enhancing the way it is experienced visually and tactilely. In traditional architecture, Moroccans use drapery as interior divisions and doors allowing for a seamless transition between spaces. 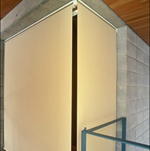 The flexible and soft material reduces physical effort in moving through areas and eliminates the sound generated by the opening and closing of doors. When curtains are used in relation with the natural surroundings, “interiors and exteriors more than playfully coexist --they blur and clash, then recombine to form something new. ‘. . . the garden comes in, the curtain comes out.’"8 Picture scrolls depicting Shinden-style interiors leave evidence of Japanese court houses using bamboo blinds and curtains as exterior partitions allowing a sincere relationship between inside and outside as garden scents come in and the rain stays out. In modern architecture, Soft Wall constituted the adequate complement for the flourishing fluid plan surrounded by glass. In the Tugendhat House in 1930, Mies van der Rohe used Soft Wall to open up the house for social activities and showcase it to visitors, while still being able to enclose it for the comfort and privacy of daily routines. Furthermore the house itself became a Soft Room as its perimeter glass walls disappeared to reveal only the surrounding curtains. The rigid monotony of the rectilinear geometrical forms used in modernism was also equilibrated with the rhythmic hanging drapery that added enjoyment to the space through curves and texture. It is not until the late 20th century that Soft Room appears as an independent space by using Soft Wall to create a spectacle of light, color, texture and pattern. Fashion designer Emmanuelle Khanh conceives Soft Room as a precious envelope made of metal beaded strings to showcase a dining room set in a kitchen room; the metallic beads from which the Soft Room is made shines in unison with the stainless steel industrial kitchen making light to bounce throughout the space. In the space, Soft Room is centrally positioned to recall the attention of the viewer and emphasize the importance of the elements it encloses. 1) Amanda Lam and Amy Thomas, Convertible Houses (Salt Lake City, Utah: Gibbs Smith Publisher, 2007), 49. 2) Melissa Milgrom, “OMA Earth Mother,” Metropolis Magazine, http://www.metropolismag.com/html/content_0401/milgrom/. 3) Yang, “Fluid Wall,” http://designexchange.cornell.edu/. 4) Lam and Thomas, Convertible Houses, 137. 5) Kate Ellen Rogers, The Modern House, U.S.A.: Its Design and Decoration (New York: Harper & Row Publishers, 1962), 239. 6) Rogers, The Modern House, 250-51. 7) Milgrom, “OMA Earth Mother,” http://www.metropolismag.com/. 8) Milgrom, “OMA Earth Mother,” http://www.metropolismag.com/. 9) Lam and Thomas, Convertible Houses, 81. 10) Evidence for the use and the chronological sequence of Soft Room as a house archetype was developed from the following sources: 1950 Kurt E. Appert House Joseph Allen Stein Architect; Atherton, CA in John Hancock Callender, "Six East and West Coast Houses," Architectural Record 110, no. 5 (Nov. 1951): 128; PhotoCrd: Ernest Braun; Vacation House for Herbert M. Agoos  Charles Burchard and William Lyman Architects; East Andover, NH in "Vacation House," Architectural Record 118, no. 2 (Aug. 1955): 135; PhotoCrd: Joseph W. Molitar / 1990 Richard Brayton House  Richard Brayton of Brayton and Hughes, Architect; San Francisco, CA in Henry Urbach, "The Streets of San Francisco," Interior Design 68, no. 9 (July 1997): 106; PhotoCrd: J.D. Peterson / 2000 Naked House, Case Study House 10  Shigeru Ban Architects; north of Tokyo, Japan in Naomi Pollack, "Amid Rice Paddies, Shigeru Ban Creates Naked House," Architectural Record 72, no. 4, Record Houses 2001 (Apr. 2001): 152; PhotoCrd: Skinkenchiku-sha; Dallas Austin House  Architropolis Corporation, Michael Czysz, Architect; Atlanta, GA in Georgia Dzurica, "The Starship Serenity," Interior Design vol. 77, 1 (Jan. 2006): 189, 190; PhotoCrd: Eric Laignel. 2) Mendez, Marta. “Theory Studies: Archetypical Practices of Contemporary House Design.” M.A. Thesis, Cornell University, 2008, 141-150.